There are ways and dorm products to make your dorm walls look good, and then there are ways and dorm stuff to make it look fabulous! Which would you prefer? 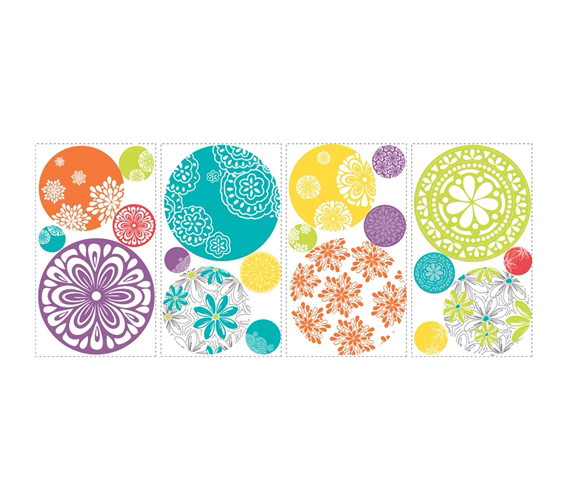 With our Intricate Decor Circle Dots - Peel N Stick you'll be more toward the fabulous side. These dorm wall decor products bring plenty of fun and color to those otherwise bland dorm room walls. If you're really feeling adventurous, you can even combine these college wall decorations with some other dorm posters or wall decor to make your dorm room unique, colorful, and all around the most fun-looking room in your dorm! No matter what color your college bedding is or what theme you're trying to achieve, these adhesive yet reusable college wall decorations add a decorative touch that brings out the fun side of college. Since that dorm room will be your hangout zone for at least a couple semesters, you'll want to hangout there only if you took the time to make that living space look nice. Since colleges are filled with enough serious-looking buildings (from libraries to lecture halls), your dorm room shouldn't be one of them. Fun dorm stuff makes college ... fun! So keep those dorm walls looking their best, and dorm life will be that much better.